Not the unchaste, brazen maid! 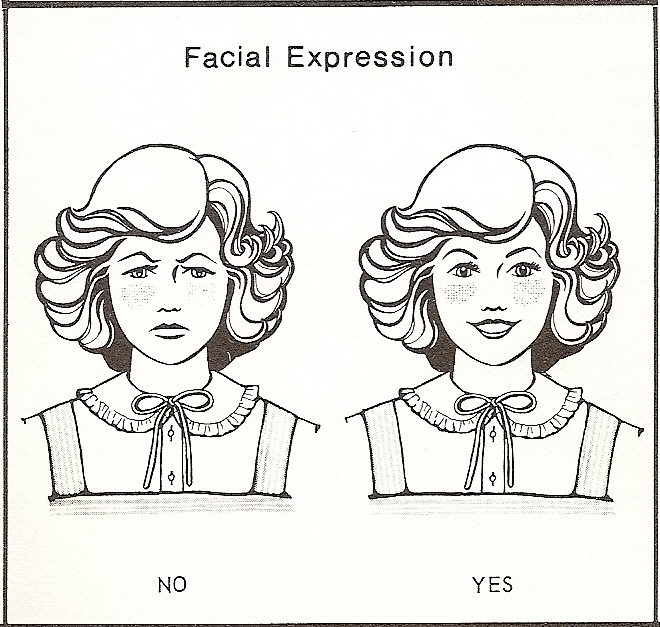 The Christian Charm Manual lesson entitled “Facial Beauty From Within” provides clear answers about acceptable facial expressions and the dire consequences of frowning. The facial instructions are clear. Yes? 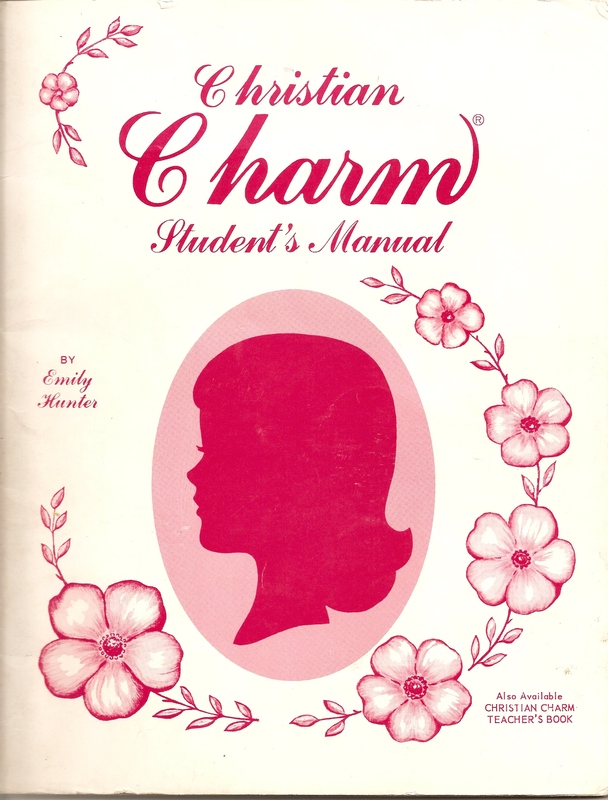 Curriculum at my school may have been devoid of serious literature, but we did read poetry in charm class. This gem from this workbook page gets to the crux of the problem with girls: sometimes they can be a little brazen. Pouting lips that fret, defy. God’s own beauty dwelling there. For her life shines true and clean. How insidious is this poem? Girls are either “happy rainbows of delight,” or they’re pouting and defying someone. It’s all rather black and white, despite the colorful imagery. You can either project a perfect beacon of uninterrupted joy so that God will want to dwell with you, or you can be flippant, which is somehow an opposite of joy. In the most bizarre twist, you must also remain afraid. This seems vibrationally impossible, not to mention a generally outrageous thing to teach. But there it is in my official curriculum: fear is a virtue. Naturally, there were no sports for girls at my school – how could a girl stay both clean and demure in such a precarious situation? Today’s sporty lasses must look positively fiendish to Emily Hunter, charm book writer extraordinaire. I have to admit something, though: the school allowed cheerleaders. (And, um, I was one.) I guess the activity seemed acceptable since we were really just there to support the boys. We positively beamed with humility that way. We bounced around pretty forcefully and waved our arms with verve, but we knew to be careful of kicks. Any revealing high kicks could have brought our squad down faster than a trumpet blow could have whisked us up for the rapture. Cartwheels and back flips were out of the question (too “flippant” and “unafraid”-looking, no doubt), even though our skirts extended below our knees. 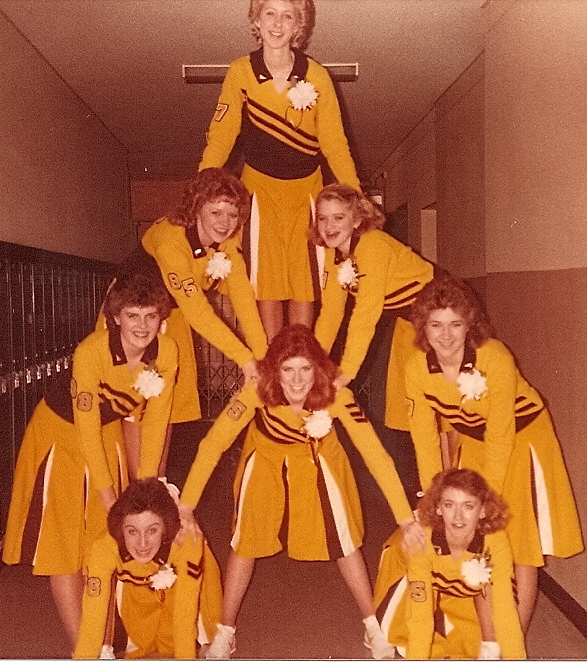 Yes, go ahead and soak that in: it was the year of our lord 1985, and our cheerleading skirts extended below our knees. Not far below our knees, mind you – just two inches. I mean, we weren’t wearing bonnets with our pom-poms or anything. Because that would have us made us look nuts, you know? Undo the Charm Marm: What I like to call “my quirky education” gave me more than an immoderate desire for perfection, a skewed vision of virtue and an absolute refusal to ever wear a skirt longer than knee-length again. It also led me to discover the charm-school-cheerleading continuum … my very own mathematical model. Now clearly, I’m no physicist. But we know that space is curved and time is relative. So after years of frenzied scribbling on my mind’s blackboard, I bypassed my indoctrination. As it turns out, it really is that simple. Not always easy, but simple. Instilling fear is the oldest trick in the book. We’re susceptible when we’re young, and some of us believe what we’re told. The good news is that we’re all grown up now. We can detach from those ingrained patterns of fear – first, by recognizing them. Truth is always peaceful and loving. Fear drains our energy and fills us with doubt and anger. Truth leads to constructive action and compassion. More on that re-programming later, kitty cats. In the meantime, remember that you’re rainbow-y delightful, just as you are. These days, I flaunt my happy self about quite brazenly. So score one for the girls. *No offense to the actual Jesus intended. Jesus is not a registered trademark of organized religion and was quite the divinely brilliant rebel.